Conveniently located on the corner of Pike Street and 7th Avenue, adjacent to the Sheraton and across the street from the Washington State Convention Center. 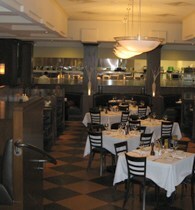 Daily Grill is within walking distance to Paramount, ACT, 5th Avenue Theatre District and great shopping. The large menu and comfortable décor makes Daily Grill Seattle the place in Seattle’s downtown shopping corridor to enjoy great food and artesan cocktailModeled after the great big city grills of the 30s and 40s, Daily Grill serves traditional American fare. Featuring Genuine Angus Steaks and Chops, Fresh Seafood, Classic Cobb and Caesar Salads, Meat Loaf with Mashed Potatoes, Chicken Pot Pie and not-to-be-missed Desserts, all served in a sophisticated yet casual atmosphere by servers that really care about the guest's experience. We also boast the best Martini and Happy Hour in town, and an extensive wine list is available.